Located in the South Pacific, Tahiti and her Islands covers a huge ocean surface covering some 4 million km2, which is the same area as Europe. However, dry land only represents 4000 square kilometres (2159 sq. naut. mi.) divided among 118 islands, separated into five archipelagos: the Marquesas to the north, the Society Islands and the Tuamotu in the centre, the Australs to the south and the Gambier to the southeast. Sprinkled like a handful of stardust in space, Tahiti and Her Islands are easily characterised by their isolation. Most islands are only sparsely populated and forty of them remain uninhabited to this day. The idea of overwater bungalows began in our islands. They represent the ultimate level of indulgence: luxury in paradise. Let yourself be rocked to sleep by the water lapping against the stilts, watch fish dance through the glass pane in the floor, dive off your terrace into a natural aquarium and wake up to breakfast brought to you in a traditional dugout canoe: who wouldn’t want to make this dream a reality? Divers the world over recognise Tahiti and the islands for their diving sites and passes with more fish than anywhere else in the world. For connoisseurs, Rangiroa, the largest atoll in the Tuamotus, Fakarava, the Mecca of diving, and Tikehau are mythical places. The Society Islands, the Marquesas and the Austral Islands also offer perfect spots where you can also see large sea animals (sharks, rays, dolphins, whales, etc.) as well as thousands of colourful reef fish. No visit to Tahiti and its islands is complete without trying the local speciality: raw tuna marinated in lime and diced vegetables, sprinkled with freshly squeezed coconut milk. Mobile food vans, snack bars and restaurants all offer this speciality on the menu. There are other outstanding local dishes that are a must and should be sampled, too: Chinese-style raw fish, chow mein, ma’a tinito and, first and foremost, dishes baked in a Tahitian oven (ma’a tahiti) offered by some restaurants on Sundays. The municipal market at the centre of Pape’ete is where all the hustle and bustle is focused. It opens at the crack of dawn with fruit, vegetable, fish and flower stands. Handicraft stalls contain products from the four archipelagos (carvings, tifaifai patchwork quilts, jewellery, sarongs (pareos), basketry, etc.). If you visit the market before you leave, you can load up on souvenirs to take back home (vanilla, crafts, monoi, musical instruments, etc.). Not to be missed is a visit to the market Sunday morning at 4.00 a.m., before mass. Moorea, 17 km from Pape’ete, is reachable by fast ferry in only 40 minutes. It is the most sparsely populated island (just 18,000 people) and things there are still unspoiled. You can do a day-trip, but if you want to fully explore the island you’ll need a few days. Physically setting foot on a “low island”, or atoll, is an unforgettable experience. Seeing a chain of coral islets, each encircling a turquoise lagoon, stretching on for dozens of kilometres is a breathtaking sight from the plane. Just imagining people living in this environment, lost in a vast expanse of ocean, is almost surreal. 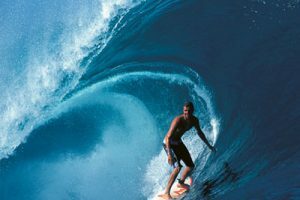 Sharing the daily lives of the islanders in tune with the rhythm of the waves, even if only for just a few days, is beyond words…It was on these tiny islets that Tahiti’s cultured pearl industry began. The most frequently visited atolls are Rangiroa, Fakarava and Tikehau, all of which have internationally rated hotels. Other less well-known atolls have family-run guest houses, offering guests a warm welcome. Found on most islands, these archaeological remains bear witness to the organisation of Polynesian society before the arrival of missionaries in the 18th century. The largest archaeological complexes are found on Raiatea (a world renown marae), Huahine and in the Marquesas. Forbidden by missionaries, dancing is even more an integral part of Polynesian culture today. Girls and boys begin dancing as soon as they can walk. 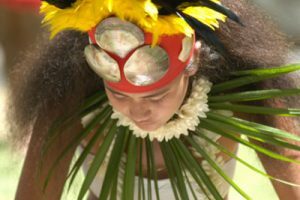 The annual Heiva i Tahiti festivals in July, organised in Tahiti and on most islands, is a chance to see a performance by the most famed professional dance troupes and schools. Major hotels regularly organise Polynesian evenings with song and dance during happy hour or themed buffet dinners. Follow in the footsteps of the first missionaries to the Gambier Islands. Mangareva, the largest island, is the site of the first Catholic mission, established in 1834, and abounds in the historic traces of the first missionaries. Every year from July to November, Rurutu, in the Austral Islands, becomes a prime observation platform for watching whales, which come there to calve just off the coast. It is a unique spectacle reserved for you alone. The Austral Islands will give you the unparalleled feeling of being on the other side of the world. Go to the Marquesas by sea aboard the mixed cargo/passenger vessel, the Aranui, or by plane, a more conventional mode of transport. Arriving in the Marquesas is always a double shock: first, witnessing a cultural revival that has been going strong these last 20 years, and second, the discovery of its wild and pristine natural beauty.